Can the Windows 10 Icon Be Removed from the Task Tray? QUESTION: Can the Windows 10 Icon Be Removed from the Task Tray? ANSWER: Yes it can. It can be removed or uninstalled. The preference is to uninstall it. 1) Go to Windows Update. 2) Read where to Uninstall Updates. 4) WRITE DOWN the KB Update Number! 5) Then uninstall the update. 7) Open Windows Update again. Look for the KB number you wrote down. 8) Put you pointer on the line with the KB number, left click once to highlight. Then right click on the KB to hide the update. Then manually search for new updates to see that the update is no longer there. 9) YOU NEED TO READ EVERYTHING THAT IS IN FRONT OF YOU AS YOU PROCEED. 10) This is NOT an automated program to do this in one click. 11) This procedure has been tested by over 450 people with Windows 7/8/8.1. How closely have you reviewed your LinkedIn profile and all of the words on your website? Do you proofread the proposals, documents and professional letters you write? Misspellings, typos and errors hurt your image. It's critical that you check your work or have someone reliable do so. Check the basics: Electronic spell check (such as in Microsoft Word software) can help you spot some typos and misspellings. But you also need to slow down and closely proofread for wrong words, such as "form" instead of "from" and the sneaky "it's" when you mean "its." Magnify it. On a screen, zoom in to make your text size larger so you can read it easily. Print it. You will spot mistakes on paper that you don't see on the screen. Read it aloud. Hearing your words is different from seeing them. Listen to your gut. Don't ignore that feeling of hesitation about something. If you think to yourself, "That's how he spells his name, right?" imagine alarm bells clanging. Go check the spelling. Check facts. If you're including a phone number, website or address, check it. Call the phone number. Copy and paste the URL into your web browser. (Don't type it in, since you need to check what's actually in your document rather than what you meant to type.) If you've got a list of five numbers and you say they add up to 2,873, check the math. Be consistent. Your tone and the way you use capitalization, abbreviations, quotation marks, boldface and italics shouldn't vary within one document. Use commas, hyphens and dashes competently. Wait. Set your document aside and read it with fresh eyes in a couple of hours or the next day. Keep a list: If you tend to misspell certain words or make certain mistakes, make note of it and keep the list handy to consult when you're proofreading. Hire a professional editor. Do you know the difference between affect and effect, how to use possessive apostrophes and the importance of pronoun-antecedent agreement? When you lack expertise in grammar, spelling or clear writing, a professional can save you from embarrassing errors and help you come across better. Chris Swingle Farnum is a freelance journalist, writer and editor. Drawing on more than 20 years' experience as a daily newspaper reporter, she writes and edits reports, newsletter articles, press releases and other copy for individuals and organizations. We all know how important it is to create passwords that are not easy to crack. That means no pet names, social security numbers, birthdates of your kids, and so forth. So, how do you create a clever character string that has the appearance of randomness, yet is easy to remember? Next, pick a 3-4 digit number that has meaning only to you. It could be your ideal weight, the sum of your children’s birth years (1984, 1988, 1991 = 5963), or perhaps four sequential numbers from your library card. What we’re looking for here is something seemingly random, yet meaningful to you. My special thanks to JT for teaching me something new, effective and fun. Hope this makes your computing easier, safer, and of course, more organized. And if you have a favorite trick or tip you’d like to share with others on how you organize yourself, please let me know. From almost the first release of Windows, Microsoft has included a calculator in the Accessories menu. At first it was just a Standard four function calculator but later they added a Scientific version. 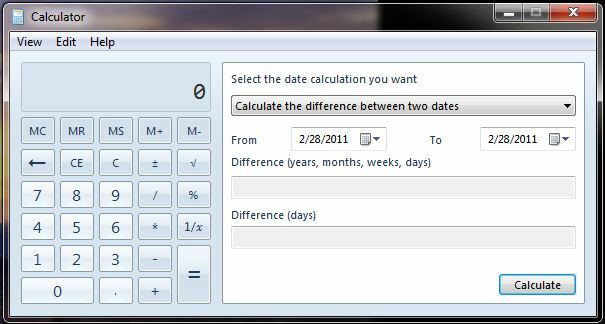 With Windows 7, Microsoft expanded the calculator to include Programmer and Statistics. But they didn’t stop there; they added Unit Conversion, Date Calculation and Worksheets. Answers can be Copied/Pasted into or from any document using the Edit menu or keyboard shortcuts. The Standard calculator provides the usual add, subtract, multiply and divide functions but also includes percentage, square root and reciprocal functions. The calculator responds to the numeric keypad on the right side of your keyboard. This includes the plus, minus, estrous key for multiplication and the forward slash key for division. The Enter key acts as the equal key on the Calculator. To sum 5 and 3 you can use the numeric key pad by pressing 5 + 3 Enter will give you 8 for the answer. If you want to calculate the sales tax of an item, you press 49.95 * 8 % (shift 5 on the regular keyboard) and you get 3.996. Display control keys are C to Clear the calculator, CE for Clear Entry and the  is Backspace. Clear is straight forward, it clears all math operations in the calculator. Clear Entry only clears the present entry i.e. if you enter 5 + 3, CE will clear the 3 but leave the 5 + operation. The Backspace edits the present entry. If you entered 56789 but meant to enter 56709, press backspace twice to get 567 and then enter 09. There are also memory keys. They are listed below along with their function. MC – Memory Clear – clears what is stored in the calculator’s memory. MR – Memory Recall – recalls what is stored in the calculator’s memory. MS – Memory Store – stores the displayed number into the calculator’s memory. M+ – Memory Add – adds the displayed number to the number already in the calculator’s memory. M- – Memory Subtract – subtracts the displayed number from the number already in the calculator’s memory. Besides the normal four functions of the Standard calculator, the Scientific calculator provides trigonometric calculations in degrees, radians or grads. You can also calculate roots, cube roots, cube numbers, X to the Y power and logs. It will display pi to more places than you need. Software programmers will find this feature invaluable in doing logic math. It’ll convert decimal to hexadecimal to octal to binary in any format from byte to qword. Statistics is not my field of expertise so all I can say is I would think this calculator would be of help to statisticians. As you can see, this will convert a wide array of units to useful values. Select the type of unit such as length, enter the value like 1000 Feet and convert it to Meters you get 304.8. You can convert 50 Gallons (US) to 189.2705892 Liters or 10,000 Square Feet into 0.22956841… Acres. You can calculate the months, days or years from one day to the next. For instance you can calculate that there are 299 days from March 1st till December 25th (Christmas 2011) or 90 years till March 1, 2101. We can all use quick calculations of certain information and the Worksheet functions are handy. You can calculate Mortgage, Vehicle Lease or Fuel Economy. For Mortgage, just enter the Purchase price (169000), Down payment (20000), Term in years (30) and Interest rate (5.25) and select Calculate to get your monthly payment ($822.78). 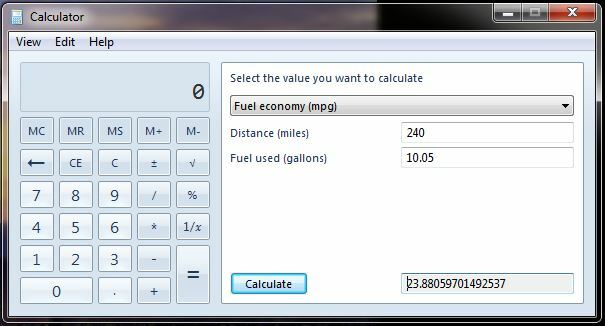 For Fuel economy, enter the Distance in miles (240) and the Fuel used in gallons (10.05) and select Calculate to get your miles per gallon (23.880). The Windows 7 Calculator is a lot more functional then previous versions and always ready whenever your computer is running. Does Carbonite Back Up Programs? At the last Tech Forum, the online backup program, Carbonite, was discussed. It was mentioned that Carbonite won't back up your programs, just your files. If there was a disaster, your program discs would be destroyed. And then you wouldn't be able to open your files. Some say that Carbonite is the best backup solution around. It stores your files in a secure, remote location. This keeps them safe from a localized disaster. However, Carbonite doesn't back up programs. That's because it wouldn't do you any good. Windows programs are notoriously difficult to back up and restore. To do this properly, you would need to create a full disc image. But no remote backup system does that. A disc image would be far too large. And even then, some programs won't run after the image is restored. Windows 7 has a good image backup process without going online at all. The backup “image’ is best stored on an external hard drive. You shouldn't have to worry about it losing a program, however. Most of your files should be common formats, like JPEG or DOC. Even Windows can view them without extra programs. They can also be opened on other computers and smart phones. Besides, almost any program can be purchased again. But replacing that once-in-a-lifetime photo file is impossible. A backup isn't just about saving money; it's about saving memories. The only potential problem is older programs and proprietary file formats. Even then, there are file converters that can probably help. If the program is incredibly obscure, then you should be concerned. It is recommended that a fireproof safe or safety deposit box for those program discs. And you might think about switching to a newer program. Carbonite is used to keep information safe. It comes highly recommended. It also features a 15-day free trial. But remember, it only backs up files, not programs. Most of the time when Microsoft comes out with a new version of Office, the new features are not necessarily useful by those of us in small businesses like consulting. They require interaction with Microsoft’s servers such as SharePoint Server. 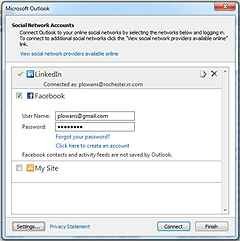 But Outlook 2010 does have a feature that is quite useful, the Microsoft Outlook Social Connector which displays LinkedIn, Facebook and MySpace social media information in emails and contacts windows. To view the information, you need to turn on the People Pane. Select /View/People Pane/Normal. To see what this does, open an email. Here’s one from Barbara Moore. Note her Facebook picture, Facebook entries and along the upper right edge are pictures of other people she sent the email to. On the web page, click on the corresponding link to download each add-on, and then install it. 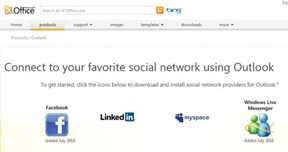 You can install more than one social network. Make sure you choose the correct add-on for Facebook. There are two downloads, one each for 32 bit (OSCFB-x86-en-us.exe) and 64 bit (OSCFB-x64-en-us.exe) Outlooks. Most of us have 32 bit Outlook. To find out which version of Outlook you have, select /File/Help. To the right you will see, About Microsoft Outlook and the version will list it as either 32 or 64 bit. This is somewhat independent from whether you are running 32 or 64 bit Windows. Office 2010 32 bit will run fine on either 32 or 64 bit, Windows Vista or Windows 7 but Office 2010 64 bit can only run on 64 bit Vista or Windows 7. At this time LinkedIn and MySpace add-ons are strictly for 32 bit Outlook 2010. Select each connection one at a time and enter your username and password for that social media. To complete the process select the Connect button at the bottom of the window. If you have entered the correct account information, you’re finished with that account and can go on to the next account. When you’re done setting up all your accounts, select the Finish button at the bottom. You can disregard the My Site account. It’s for larger companies that have servers and their own internal version of a social media. One of the advantages of the Outlook Social Connector is if you receive an email from someone and you want to add them to your social media network, all you have to do is select the Add button below their picture and the social media network you want to add them too. You’ll be provided with a window that lets you send your request to add them to your network. There you have it; you are now connected through Outlook to your social media networks. Here is another installment of the new monthly newsletter article called Techie Tips & Tricks. The theme is interesting tips and tricks surrounding technology, any technology whether it is computers; cell phones; travel or widgets (i.e. anything). I don’t want this to be MY article, so I expect everyone to contribute. Maybe you had a good answer to a question at the Technology Forum this month; write it up and send it in before the 15th of the month. Many of us use Outlook for our email and more. I thought I would discuss some of the features, specifically to do with email. For the purpose of this article, I will provide information on getting to the commands for Outlook 2007 but include in parenthesis the same for Outlook 2010. For Outlook 2007 I will list /View/Navigation Pane/Normal, which means to select the View pulldown menu, then the Navigation Pane and finally the Normal command. For 2010 I will list it as /View/Layout/Navigation Pane which means start with the View tab, the Layout ribbon and the Navigation Pane on the Layout ribbon. Under Outlook 2003, you could have multiple POP3 email addresses all feeding into one Inbox. This is because you Outlook 2003’s information was contained in one Outlook.pst file. 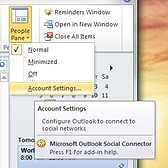 With Outlook 2007 and 2010, each email account has its own pst file to manage each email account. If I had two accounts, one called plowans@rochester.rr.com, and another plowans@lowansitservice.com then I would have two corresponding pst files called plowans@rochester.rr.com.pst and plowans@lowansitservice.com.pst. Separating your email accounts into individual Inboxes (pst files) accomplishes two things. First, it separates your email by account and second, it helps to keep down massive amounts of email in your Inbox. Remember, the more emails you store in your Inbox the larger it is and as you amass more and more email, Outlook begins to have problems. I’ve had clients with thousands of emails in the Inbox even if they are in spread subfolders, as long as they are under the Inbox part in the tree, they are included as part of the Inbox. As I have pointed out in previous Techie Tips & Tricks and also at Technology Forums you need to move you email out of the Inbox into folders at the same tree level as the Inbox. That way you still have access to the emails but they are not considered part of the Inbox. Having multiple Inboxes and individual folders for storing email can make your Outlook tree difficult to work with. Microsoft made it easier as part of the Navigation Pane. The Navigation Pane is on the left side of the Outlook window. It is made up of three parts. Starting at the bottom, you have the buttons for the different features of Outlook,such as Mail, Calendar and Contacts. Next, above the buttons you see a hieratical tree of folders for each feature. Some of the folders include the Inbox, Deleted Items and Sent Items. Also listed here are the Inboxes for each email account. Emails listed on the right can be dragged and dropped to folders in the tree on the left. The top portion of the Navigation Pane is the Favorite Folders (Favorites). By default it contains the default Inbox, Sent Items and Deleted Items. If your Navigation Pane is not visible you can turn it on by selecting /View/Navigation Pane/Normal (/View/Layout/Navigation Pane). If the Favorites Folder is not visible in your Navigation Pane, select /View/Navigation Pane/Favorite Folder (/View/Layout/Navigation Pane/Favorites). To increase your main viewing area of the window, you can minimize the Navigation Pane by selecting the double arrow to the right of Mail (single arrow to the right of Favorites). This collapses the Navigation Pane to the left, increasing the main viewing area of emails. To maximize the Navigation Pane, select the right arrow at the top of the column. You can list any folder in the tree as a Favorite. To do this right-click on the folder and select Add to Favorite Folders (Show in Favorites). If you list each email account Inbox in the Favorite area, navigating to each inbox is easy. To remove any folder from the Favorite Folders (Favorites), just right-click on the folder and select Remove from Favorite Folders (Remove from Favorites). Here is another installment of the new monthly newsletter article called Techie Tips & Tricks. The theme is interesting tips and tricks surrounding technology, any technology whether it is computers; cell phones; travel or widgets (you know anything). I don’t want this to be MY article so I expect everyone to contribute. Maybe you had a good answer to a question at the Technology Forum this month, write it up and send it in. Of course I will have at least one tip or trick per month but if you have a good one, just send it to Dave Young (RPCN@frontiernet.net) before the newsletter deadline (the 21st of the month) and I’ll let Dave decide what to use. I won’t be mad if he doesn’t choose mine. As you may be aware, RPCN launched its new website this past month. Many of us have spent a lot of our own time getting it ready. I wish to personally thank Emily Carpenter and Steve Royal for this effort. It wouldn’t be the website it is, if it weren’t for them. I would also like to thank the other members of the Web Development and Communications committee, Linda McQueen and Dave Young, who helped in the decision making of the Logo and website. Many times at either the Tech or Business Forums the question has come up about how do you create your own website for your business and that’s the subject of this edition of Techie Tips & Tricks. Business websites should be part of your marketing strategy; it should help you attract business, it must make potential clients want to call you for business and not drive them to someone else’s website. In short, if you want to attract clients to your business website, call in the professionals. You may know your business but you unless your Emily or Linda or Barbara or any of the other nine website designers in the RPCN database, you don’t necessarily know how to professionally present it on the web. Probably one of the most compelling reasons for getting a pro to do your website is search engines. If your clients can’t find you on the web, then all the work you did is wasted. Open up your browser to Bing, Google or Yahoo, and search for rochester consultants. In fact try each search engine and the RPCN link is at the top of the list (not counting the sponsors). One reason it’s at the top is because of traffic, i.e. the members are using the site to find out what it’s all about and to update their profile. The more clients access your website, the higher it’ll be on the search results. Secondly, we have links to other websites that are relative to our site and some of them have links to our website. This can bump you up in the search engines also. The next compelling reason to call in the pros is that your design will not be as easy to access or use as the pros. When someone comes to your website, you only have a few seconds to capture their interest and tell your story or they’ll go on to the next consultant. That could be lost opportunities that could actually help pay for your website. For the RPCN website we enlisted the help of a graphic designer to design the overall look of the website. This included a new logo. As Emily pointed out in last month’s newsletter it needed to be updated to “appear as professional as possible to potential members and customers”. This is called branding and Amanda Altman of A3 Design told us about branding at the April 9th meeting. Your website needs to show off your brand. You’re a professional, now show it! After the graphics were done, it was handed over to a coder who after completing some background research and selecting the appropriate template made the menu links work and created all the basic page designs. This was based on the old site’s site map (hierarchy of the website). This all happen over a three month period of emails and phone calls to iron things out. Can you afford to spend three months of your time to create your site just to have it not make money for your business? Finally Steve Emily and I put the content in the site and we’re still working on it. Websites are not easily created and you have to have some artistic talent besides programming knowledge to create a successful one. All in all I think it is a very professional and functional website for RPCN, a business website like you should have.